Most flagships of 2014 have moved to 2160p video capture. The Nokia Lumia 1020 and Apple iPhone 5s hail from last year and are limited to 1080p. The Nokia Lumia 1020 doesn't have the hardware required to record 2160p videos but the whopping big sensor enables lossless digital zoom - up to 4x for 1080p footage and 6x for 720p. Additional options let it record 24fps and 25fps video for more cinematic feel. There are two mics with proprietary Rich Audio Recoding with an optional Audio Bass Filter, which will improve sound quality if you record live concerts. The optical image stabilization makes videos look better subjectively - without it, handheld videos often become shaky, like the kind we associate with cheap camcorders. Sony has also added two exclusive video streaming features to the Xperia Z2 - it can stream live video to Facebook and YouTube. With more and more people becoming video content creators this can be a must-have feature. Vine (the social network based on 6-second videos) is built right into the camera. The Samsung Galaxy S5 also manages up to 4x digital zoom at 1080p video and the results look very good. A neat trick is dual shot, which records videos with both cameras simultaneously. This mode is available in the still camera as well. The LG G3 has relatively few extras - the slow-motion detailed in the table above and dual-capture similar to the Samsung. The Apple iPhone 5s has the fewest video camera features - a slow-motion mode and digital video stabilization but nothing special. The Oppo Find 7 is right there with it - the Oppo team spend much more time developing the still camera than the video camera. We test the video quality in two consecutive test. First, in good light, and second, in low light. We shoot both 2160p and 1080p videos. Two of our contestants can't do 2160p (the iPhone and the Lumia), but 1080p videos are still important in their own right - many don't have UHD TVs or other screens capable of displaying 2160p footage, plus it's often an unnecessary strain on storage and bandwidth. Before we start, here's a table showing the total video bitrate for each phone plus details on the audio. 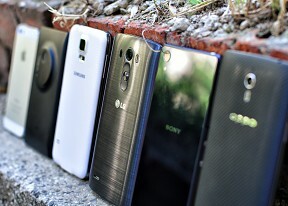 We'll begin with 2160p videos as that's a premium feature on the newfangled flagships. 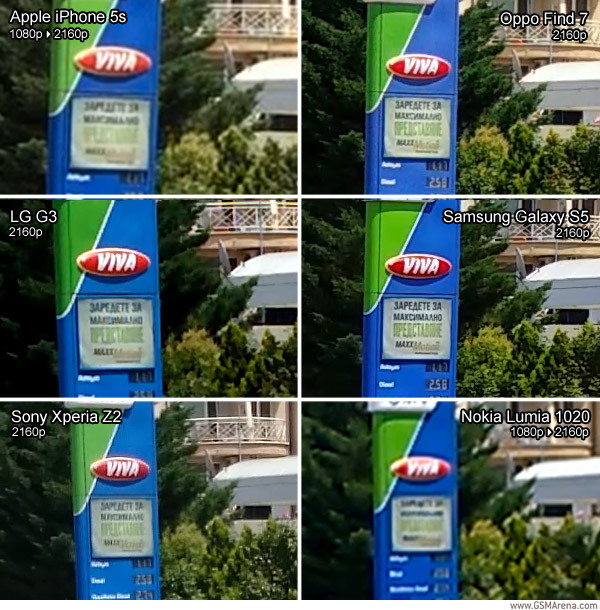 For comparison purposes we upscaled 1080p video from the iPhone 5s and Lumia 1020 to 2160p. The Samsung Galaxy S5 shoots at the second-highest bitrate at 2160p and it's well-worth it - the image is very sharp with tons of detail and no noise. Keep in mind that the Galaxy S5 has one of the narrowest fields of view of the bunch, which makes a difference in fine detail. As usual the processing is visible in the boosted colors, increased colors and sharpening halos. The continuous autofocus triggers a bit too often (at least it's fast). The Oppo Find 7 has the third highest bitrate and it has the level of detail to show for it. The image is not quite as sharp as on the Galaxy S5 (even though the FoV is nearly the same). There are some processing artifacts noticeable at 100% but it's a lot more restrained than the Galaxy S5. The Sony Xperia Z2 has a relatively wide FoV but it managed to capture a good level of detail. Not enough to justify recording at 55Mbps (the highest bitrate of the six). The post-processing looks similar to that of still images, softer than a large 1/2.3" sensor should produce. The colors are bit muted too. Sony needs to seriously work on the continuous autofocus though, it's way too eager. The LG G3 video is softer than that of the Xperia (quite noticeable in the foliage, still this is at half the bitrate). Jaggies on the diagonal white line reveal the 2160p resolution isn't used to its full potential. Post-processing is not as heavy as on its Korean neighbor. The Nokia Lumia 1020 has the widest FoV here and 1080p resolution isn't enough to cover the whole frame with acceptable detail (compared to the 2160p shooters). Colors and contrast are as boosted as on the Galaxy S5. The narrower FoV of the Apple iPhone 5s helped it capture more detail but the camera made a mess of colors. That said, the dynamic range of the videos is the best of the bunch, beating even the Lumia. Now that the resolution has been put on equal footing, the Samsung Galaxy S5 maintains its advantage in sharpness. Part of that is the heavier sharpening applied, but the advantage in resolving power that we saw at 2160p also plays a role. The Oppo Find 7 used a very low bitrate - less than half what the others use but it worked out quite well. The level of detail is lower than what the Galaxy manages but the image is nearly as sharp as that of the LG G3 without looking too processed. Find 7 videos also take 60% less storage than LG G3 videos. The LG G3 video appears a tad sharper but the oversharpening halos reveal how that was done. We docked a few points of the G3 due to its narrow dynamic range - the narrowest of these six samples. This lead to a lot of underexposed shadows. The Nokia Lumia 1020 videos seem to have less detail due to the wider FoV, but they are actually on the level in terms of sharpness. Our beef with the 1020 is again the over-the-top image saturation (a conscious choice by Nokia). 1080p videos from the Sony Xperia Z2 use less than a third of the bandwidth of 2160p videos. The image isn't the sharpest but the dynamic range is good and the colors look good if a bit under-saturated. 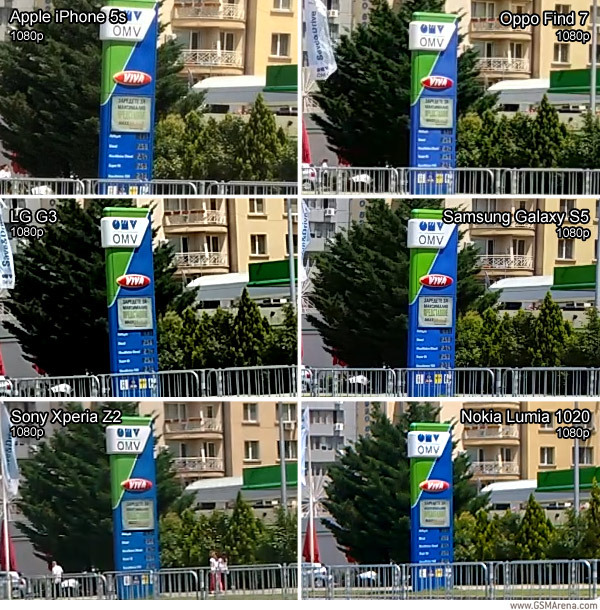 The Apple iPhone 5s videos look quite good in the 1080p comparison but the colors (red most of all) are off. The dynamic range looks pretty good and the level of detail is quite good (a relatively narrow FoV helps a lot here). In terms of audio quality the Nokia Lumia 1020 is beyond reproach. No wonder Nokia spends so much time beating the "our audio recording rocks!" drum. The phone has high-quality mics and records at twice the bitrate of other phones. It produced the most realistic sound and managed to cut the noise of the wind down quite well. The LG G3, Sony Xperia Z2 and Samsung Galaxy S5 all record at a lower, similar bitrates (the S5 bitrate is a bit lower). In terms of actual audio quality, however, they sound the same. The Apple iPhone 5s is the lone holdout for stereo audio - it has three mics on its body but it only captures a single audio channel. The low bitrate doesn't help either. The Oppo Find 7 records stereo audio at just 96Kbps (in both 1080p and 2160p videos). That kind of bitrate would be enough for stereo sound. It actually sounds worse than the iPhone (there's constant audible digital noise).